The invention of the scale is credited to Branch Rickey and whether he intended it or not, it mirrors various scientific scales. 50 is major league average, then each 10 point increment represents a standard deviation better or worse than average. As McDaniel noted, the 20-to-80 scale largely mirrors a normal distribution, with each 10-point grade jump representing an increase of one standard deviation. Following this logic, the first step towards creating an objective scale is finding “major league average.” This in and of itself presents a bit of a challenge, as major league average differs from the average of all regular (qualified) major league players. Taking the average of only qualified major league regulars would result in a skewed distribution, while including all major leaguers would result in far too many outliers (for example, a player batting .000 or .750). Therefore, the trick lies in finding a sample representative of more than just regulars but also one that isn’t easily skewed by tiny sample size variations. 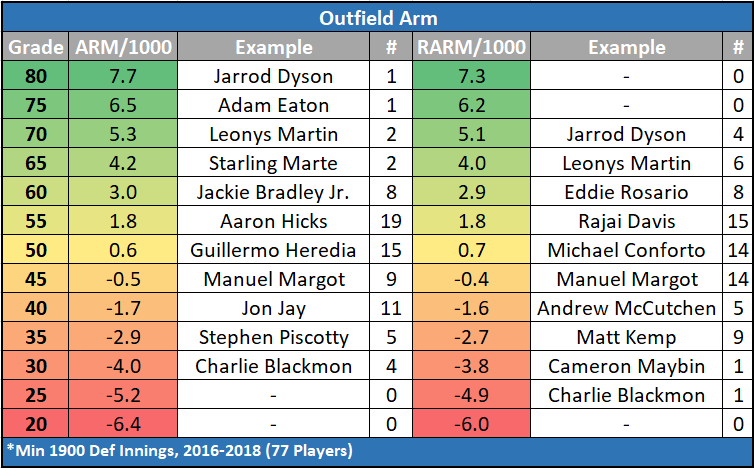 Many of the cutoffs selected are admittedly arbitrary but allow for a reasonable sample of players receiving significant time in the major leagues, and are largely based off of Russell Carleton’s excellent work on reliability. These cutoffs will be detailed with each statistic provided. Power can be measured in a number of ways, but we’ll look at four primary measures: home run rate, isolated power, average exit velocity, and barrels per batted ball event. Any player with at least 200 PA qualified for the sample for the ISO and HR% grades, while players with at least 100 batted ball events qualified for the StatCast metrics. It’s worth noting the absence of 20 or 25 power grade players, but this is possibly indicative of the emphasis teams place on hitting for power. It is nearly impossible for a player to provide enough value elsewhere to make up for a complete lack of power, as evidenced by the lack of extremely low power hitters in the league. Power may be one of the tools McDaniel mentioned in his primer on the scouting scale that doesn’t exactly follow a normal distribution. 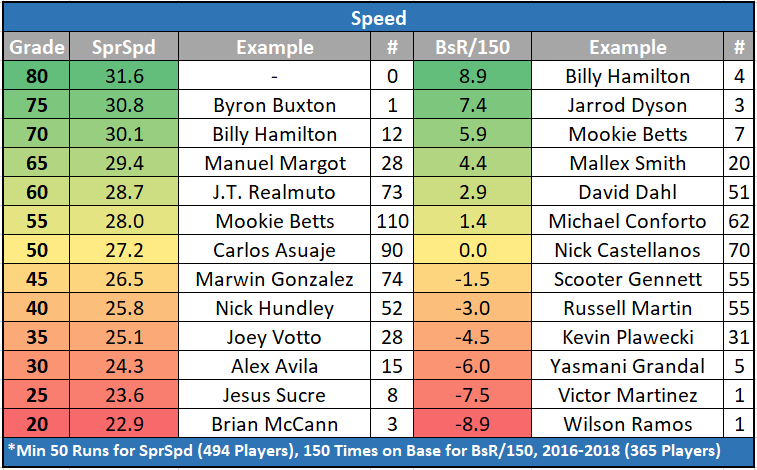 Speed is a simpler tool to look at than just about any other tool thanks to the development of StatCast Sprint Speed. Any player season with 50 or more max effort runs (2016-2018) was considered for the sprint speed component of the tool. It is also worth adding baserunning into the mix as McDaniel notes that “baserunning and good jumps out of the batter’s box are also folded into the run grade.” The baserunning grade is based on a sample of all players with at least 150 times on base over the three-year span and the parameter is scaled to 150 times on base for ease of comparison. While the hit, power, and speed tools are all fairly easily measured and interpreted, the defense and throwing tools present a new set of challenges. For one, it doesn’t make sense to compare players at vastly different positions on the same scale. For this purpose, I’ve broken down defense into three groups: catchers, infielders, and outfielders. Of the three groups, outfielders were the most straightforward. Outs Above Average provides a solid look at outfield defense (based on players with at least 1900 innings in the outfield, 2016 to 2018) but is absent for other positional groups. Additionally, the throwing components of DRS and UZR are more easily separated from the fielding-based components for outfielders, allowing for a separate defense grade (based on range and plays made) from the throwing grade. This is similarly possible for catcher defense, but the catcher fielding grade is complicated by the myriad of factors that make up suiting up behind the plate. The catcher defensive parameters include non-throwing DRS, blocking runs, and framing runs. For infielders, it’s much more difficult to break down throwing runs from fielding ones, and for this purpose it is safest to simply present the two together. 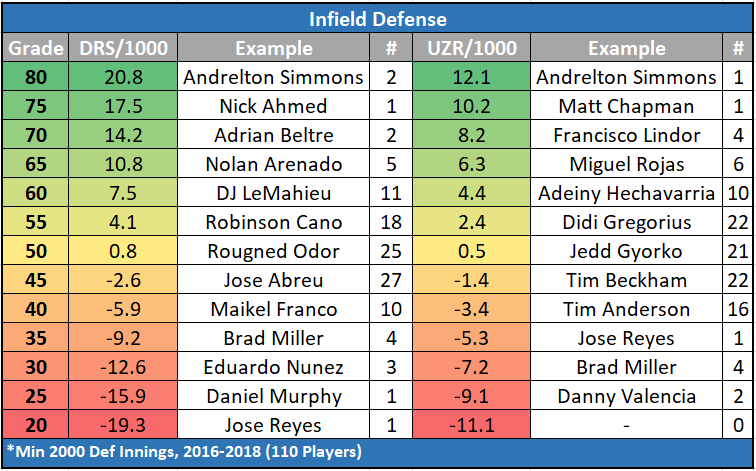 All Defensive Runs Saved and Ultimate Zone Rating data is from FanGraphs and includes any players with 2,000-plus innings played in the infield between 2016 and 2018. All UZR and DRS-based defensive metrics are scaled to 1,000 innings played. Catcher framing is scaled to per 5,000 framing chances while blocking is scaled to 2,500 blocking chances, based on all catchers with 1,000 defensive innings over the last three seasons (as are all catching defensive metrics for the purpose of this study). It’s worth wondering whether the lack of catchers at either extreme in terms of defense and throwing is simply due to the limited sample of players or is being caused by a different phenomenon. It’s possible that the clustering effect is explained by the fact that terrible catchers either don’t remain behind the plate often or don’t make the major leagues. Whether this effect is due simply to a small sample, less than comprehensive defensive metrics, or something different, it is certainly interesting to observe compared to other positions. For how often the 20-to-80 scale is discussed in baseball circles, it is interesting to note that it is rarely objectively analyzed to create a rough estimate of what each grade might look like at the major league level. The advent of StatCast has allowed for objective analysis of more tools than ever before and will hopefully continue to do so as the technology continues to develop. While my attempt at creating an objective view of the 20-to-80 scale is undoubtedly imperfect, the results certainly provide an interesting shorthand look at many of the measurable aspects of the scale. Statistical data (AVG, BABIP, ISO, HR%, BsR, all DRS and UZR components, Contact%) from FanGraphs, pulled December 11, 2018. Catcher framing and blocking data taken from Baseball Prospectus, pulled on December 11, 2018. StatCast data (xBA, Exit Velocity, Sprint Speed, Barrels/BBE, OAA, Catcher Throwing Velocity) from Baseball Savant, pulled August 23, 2018. Cutoffs for metrics largely based on Russell Carleton’s work on reliability. This piece was originally published on December 27, 2018 at the CheckSwings baseball blog. 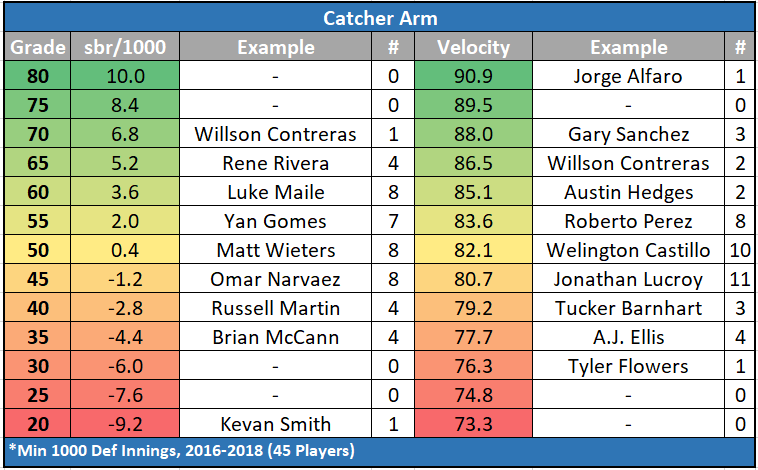 We hoped you liked reading Statcast, Scouting, and Statistics: An Objective Look at the 20-80 Scale for Hitters by H.W. Linwood! None of the images are coming up for me. Hmm, I’m not sure why that is. Maybe it depends on the browser? If the images still don’t come up (I’m using Chrome and they work for me) and you’d still like to see them, please let me know and I can email them to you or something along those lines. Have a great day! This is excellent – thanks for your work! Agreed! This was both cool and utilized research in a practical, discussable way! Glad you enjoyed it! Thank you for your kind words. Glad you enjoyed it, and thanks for reading! This is really great work. Taking all this info and assigning it to minor leaguers could cut out some of the noise playing in different leagues. Great stuff. 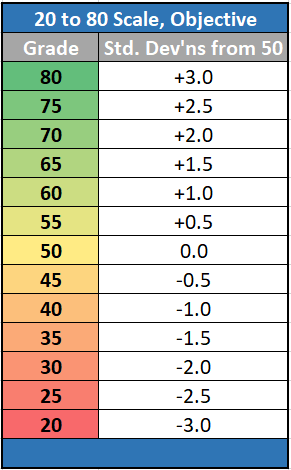 Btw did you notice that if you add the future game power grade and hit grade (using the BA and homer tresholds from the fg article on the 20 80 scale) you roughly get the expected wRC+? So basically a 40 hit/50 power guy projects for a 90 wRC+ and a 60/60 guy for a 120 wRC+. I once did an analysis and it worked out very well, except for extremely low and extremely high walk rate guys who differed a bit from this.